Clark Tracey began recording in 1980 with groups fronted by his father Stan Tracey and by 1986 also began playing and recording with his own bands. These were well rehearsed and made excellent swinging music, while introducing a number of young, very talented fledgling jazz musicians much as Art blakey did with his Jazz Messengers. For his 2014 recording Meantime... Clark took advantage of his tenure as a tutor at Birmingham Conservatoire, an establishment that boasts a formidable turnout of notable jazz musicians, to recruit three members for his then latest quintet. 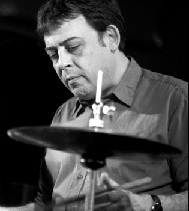 He has freelanced extensively and has worked and recorded with a number of highly respected visiting US jazz musicians and over the years has come to be regarded as a failsafe and superbly accomplished drummer in a tough, straight ahead style. Guy Barker (tp), Jamie Talbot (as,ts), Steve Melling (p), Phil Steriopolous (b), Clark Tracey (d). Suddenly Last tuesday/Deesamundo/Hippadelphia/Kath's Khorus/Pencil It In/Violets For Your Furs/New World. Guy Barker (tp), Jamie Talbot (as,ts), Steve Melling (p), Alec Dankworth (b), Clark Tracey (d). Nipstone Rock/Scattered Rock/Cranberry Rock/Devil's Chair/Shepherd's Rock/Manstone Rock/Nipstone Rock (reprise). Guy Barker (tp), Jamie Talbot (as,sop,cl), Steve Melling (p,keyb), Alec Dankworth (b), Clark Tracey (d). Descendant/Play Something Slow/Time Sublime/We've Been Expecting You/A Place In The Sunlight/Yello/The Nipper/Bombines A-guineas/Motel Time. Mark Nightingale (tb), Nigel Hitchcock (as), Dave O'Higgins (ts), John Donaldson (p), Arnie Somogyi (b), Clark Tracey (d). The Revenge Of Sam Tacet/They're Lovely/Sherman At The Copthorne/Sphere My Dear/Mark Nightingale Sang/Arnie's Barnie/Chased Out. Guy Barker (tp), Nigel Hitchcock (as), Andy Sheppard, Tommy Smith, Tim Garland (ts), Ian Bellamy (ts,sop) Gareth Williams (p), Arnie Somogyi (b), Clark Tracey (d), Christine Tobin (vcl), Locrian String Quartet. Gone/Black Coffee/Lounge Blues/Ugly Beauty/Sunshower/The Peacocks/Giant Steps/Stability/Melancholia/Boaz. Mark Armstrong (tp,flhrn), Simon Allen (reeds), Zoe Rahman (p), Peter Billington (b,el-b), Clark Tracey (d). Live Fast Die Young/The Calling/Tears In Rain/The Hitchiker/Elba Mel Delba/Fourplay/Music When Soft Voices Die/For Tony Williams. Gareth Williams (p,g), Arnie Somogyi (b), Clark Tracey (d). Baby Blue/Evans The Piano/Off The Wagon/Juice/Joshua/Just You Just Now/Libella/The Touch Of Your Lips/Lullaby Of Birdland/Spring Time. Mark Armstrong (tp), Simon Allen (as.ts), Zoe Rahman (p), Peter Billington (b,el-b), Clark Tracey (d). The Mighty Sas/The Camel/The Green M\n/Nippon Lark Soul/Online Slam/Lamia/Mama Flo/Choices. Brandon Allen (ts), Gareth Williams (p), Arnie Somogyi (b), Clark Tracey (d). C.U.C.B./Seven Steps To Heaven/So Near So Far/Given Time/Cherokee/Who Can I Turn To/Simple Simon/Smile/I Can't Get Started Either. Paul Jordanous (tp,flhrn), Piers Green (as,ts), Kit Downes (p), Lewis Wright (vibes), Ryan Trebilcock (b), Clark Tracey (d). Bolivia/Current Climate/Export/Bemsha Swing/One By One/Five Bellies/Devil's Chair. Henry Armborg Jennings (tp,flhrn), Chris Maddock (as,ts), Harry Bolt (p), Daniel Casimir (b), Clark Tracey (d). Lawra/Ojos De Rojo/A Pint Of Bitter/Elvin's Hug/What's New?/Rim Clicker/Suddenly Last Tuesday. Jubilation/Joshua/Falling In Love/The Cup Bearers/Peggy' Blue Skylight/Why Try To Change Me Now/The Dolphin/Take It To The Ozone. This page was last updated during June, 2016.